Website and processes: 10 Feb 16 Becka, 5/5 Excellent "Bought for my dads birthday, very easy to purchase, would definately recommend. " After a short pre-flight briefing you will be taking to the skies in a Robinson R44. After a short flight, during which you can take the controls, you will return to the airfield and have a go at hovering. Spectators welcome at the airfield. 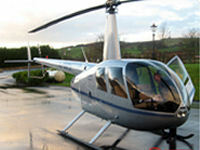 After a pre-flight briefing during which you can discuss the route taken you will be taken out to the helicopter. Once safely strapped in, your instructor will do preflight checks and talk to the tower to get permission for take off. Once airborne from Blackpool airport, you will fly up the promenade, past Blackpool Pleasure Beach, over the three piers, past Blackpool Tower and over the River Wyre. Then it will be time to return to the airfield and try your hand at hovering - it is not as easy as you think! Spectators will be made very welcome. They can look around the airfield, and have their pictures taken in the helicopter! They can wait for you in the comfort of our lounge where they will also be able to watch you taking off, hovering and landing. At the end of the flight you will be presented with a certificate signed by your instructor. Please note: flying is weather dependant. Depending upon combined weight, it may be possible to take someone with you on the back seat. Once booked, you will be asked to contact us on the day of the flight to see if the weather is suitable. If it is not suitable, you will be able to re-book the flight for another day. Each voucher entitles one person to participate in this experience. The voucher is transferable, which means that anyone can use it. The voucher remains valid for bookings for 6 months from the date of purchase. Please contact the operator	using the details printed on your voucher to arrange a date for your event. We recommend that you purchase your voucher and make a booking for your event at least one month prior to your chosen date. This is particularly important for weekend events. There are currently no reviews of this experience. Write a review. "I would like to thank you for providing the opportunity for us to book an experience flying lesson for my Dad for his birthday which he thoroughly enjoyed. We were extremely impressed with the efficency and professionalism of your service and would always use you again in the future and will recommend you to anyone who is interested in this kind of gift to give to someone." Not suitable? We have 1367 flying experiences for you to choose from at locations throughout the UK and Northern Ireland. Alternatively, our fully flexible Hotseat Coupons make an ideal gift - your recipient can use them to purchase or part-purchase any flying experience on our site.